The thought of there being podcasting jobs would’ve be pretty far-fetched in the not-too-distant past. Until recently, the medium was purely a hobby, practiced in bedrooms and basements. But it’s a medium that’s always continued to grow. Never explosively, but always slowly and steadily. We now live in an age where there are businesses built around podcasting – and that means it’s an industry with actual paid work available too. 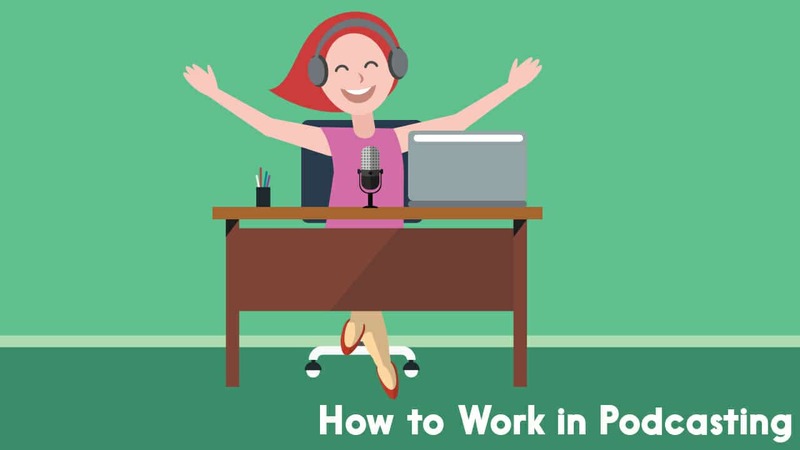 Of course, podcasting jobs are still relatively rare, so you might need a bit of help in getting one. Are you a podcaster? Do you run a podcast? If the answer is no, then I’ll point you to our How to Start a Podcast guide instead. That’s your first step! If a job in podcasting come up you’ll be up against stiff competition to get it. Be mindful that even though you have a podcast, if it only has a small amount of episodes released on a semi-regular basis with some big gaps in between, then that’s going to be a mark against you. You’ll be competing with people who are getting something out every single week. That’s not to say quality is more important than quantity. Or that you should be publishing episodes simply for the sake of getting something out. But you need to show that you’re capable of both quality and quantity. That’s what your potential employers will be looking for. The fact that you’re reading this means that you’re a creative person, so I don’t need to tell you how easy it is to come up with good ideas. Whether you’re in the shower, driving to the shop, or mowing the lawn, good ideas can seemingly drop from nowhere. The good news is that a potential employer will be looking for someone who can come up with lots of new ideas. But this can be a downside if you’re constantly so distracted by new ideas that you never actually get anything done. Lots of half-started, abandoned, or never-quite-started podcasts will make you look like the type of person who quickly gets bored and loses interest. So make sure you have at least one podcast that you’ve demonstrated a bit of staying power with. It’s a funny phrase to use in podcasting, but you need to show people you aren’t just all talk. Everyone has their own strengths and areas they really specialise in. Yours might be editing and audio production. It might be writing. Or maybe it’s social media and marketing. Whatever it is though, you should be prepared to learn and take on other roles. Most fledgling podcast businesses have small teams, and you might need to become a bit of an all-rounder in the early days. So be clear on your willingness to “wear many hats” if required. Remember, once you get a job in podcasting, you’ll still get to do the stuff you excel at too! Forget the CV or Resume, it’s better to let potential employers actually experience your work first-hand. Create a page on your website with links to your podcast and any other content you’re proud of. You can literally title this page something like “Hire Me” if that’s your style. Depending on the area you specialise in, you might create a short video or audio clip talking about your work and your skillsets. There’s scope for doing a short demo or showreel too, so someone can hit play and immediately sample your best stuff. You can also write a bit about yourself and what you’ve achieved so far, as well as the strengths you feel you could bring to a podcasting company. Podcasting is an audio medium, but the written word is still a hugely important part of it. If you write excellent comprehensive shownotes for your episodes, or run a blog and put out regular (good) content on that, it’s going to put you at a big advantage! This should be another one that doesn’t need mentioned, but there’s a few pointers I wanted to offer. If you end up in a conversation with a potential employer and get asked about your favourite podcasts, it’s handy to have thought about this in advance. Out of the shows you listen to, try to mention 4-5 that are pretty eclectic. If you just list the handful of shows you’ll typically find featured on the front page of every podcasting app ever, then it could suggest a lack of imagination. Of course, there’s absolutely nothing wrong with liking an NPR show or two. But what about the many indie podcasters out there who are creating great content? Also, don’t just list a bunch of shows. Talk a little about what each of them does well, and what keeps you listening to them. Show that you listen with an analytical brain. The more you can show that you have your finger on the pulse in the podcasting space, the better. There’s a lot of low hanging fruits here, and you might be surprised at some of the things which could put you at a disadvantage. Something ostensibly innocent like hosting your podcast on Soundcloud might raise an eyebrow, for example. There are a few good reasons not to use Soundcloud as a podcast media host, and knowing this means you keep up-to-date with the industry. This is just a hypothetical example, and if you’re creating an amazing podcast and hosting it on Soundcloud, it probably won’t be a deal breaker. But this is all about stacking conditions in your favour and trying to stand out as the best person for the job. There are a few excellent resources out there that’ll help keep you right up-to-date on all things podcasting. Podnews – Essential daily email briefing, which is complimented by its own podcast. They’ve also recently added a dedicated Podcasting Jobs board too. Podcasters Roundtable – Discussion on everything from podcasting good practices to the latest industry news stories. New Media Show – Analysis, updates, and opinions on industry news. HotPod – Long serving weekly newsletter. Takes a deep dive into the latest developments within the podcast industry. The Feed – Industry updates from the official podcast of media host Libsyn. A must-listen, even if you aren’t a Libsyn customer. Now that you’re ready to actively look for podcasting jobs, where do you go about finding them? There are a few different places worth keeping an eye on. I’ve already mentioned Podnews who feature job ads from time to time. There’s also a podcasting jobs boards on LinkedIn and Indeed.com, both with a wide variety of vacancies. But you can be proactive too. Get in touch with podcasting companies and enquire about work, even if they aren’t advertising for new staff. Ask them if they’re needing help with anything. You can use your site to showcase your work, as we talked about earlier. You might even be able to pitch some new ideas to them. Going down this route puts you ahead of the game, as you’re showing initiative rather than just waiting to see what jobs come up. Even if you don’t get any work from a company you approach, at least you’ve introduced yourself and will be on their radar should something come up in the future. I hope that’s been useful to you, and that you feel a bit more clued up about what’s needed to get a job in podcasting. If you’ve any other tips, anecdotes, or resources too, then please feel free to chip in down in the comments section. It’d be great to hear some other perspectives on this. NextPodcast Monetisation | Which Method Is Right for Me and My Audience?